Despite decades of terramechanics studies of wheeled and tracked vehicles, little is known about how to move legged robots effectively across granular media like sand. To overcome this challenge, we performed the first systematic studies of how legged locomotion depends on granular compaction, leg kinematics, and leg morphology. In each case, we discovered sensitive dependence of movement on these locomotor and ground parameters. We have also developed simple and comprehensive physics models to explain these observations. Overall, our studies provided novel leg control and design principles for legged robots to traverse granular environments like deserts, debris, and Martian soil. The use of robots as physical models, rather than animals, provides a few advantages in studying locomotion. Robots are simpler than animals, with fewer degrees of freedom and more well-defined morphology and kinematics. Robots are much more repeatable, while animals vary from one individual to another and from one trial to another and thus generate data with large variability. Robots can often be modified more easily and allow easier parameter variation, whereas animals can be hard to modify without affecting their behavior. We collaborate closely with roboticists (e.g., Dan Koditschek at UPenn, Ron Fearing at Berkeley), and also develop our own robots using traditional and novel (e.g., 3-D printing, cardboard origami) manufacturing techniques. During each cycle, the legs are tuned to slow down when around the bottom of the rotation circle, when legs are in contact with the ground (i.e., stance phase). First lesson: One cannot simply expect legged robots tuned for solid ground (which often is the case in laboratory studies) to work in more complex terrain. Second lesson: Even on the same granular media, slight changes in compaction can mean the difference between rapid movement and failure to move. This discovery also highlights how crucial it is to control compaction when studying movement on flowable ground like granular media. As a result, our ground control technique using fluidized beds has been implemented by leading field roboticists (e.g., Karl Iagnemma at MIT, Matt Spenko at Illinois IT). In addition, we discovered that for a given ground compaction, if legs rotate faster, the robot goes into failure mode; if legs slow down, movement is restored (Fig. 1, top). Furthermore, the angular span and position of the slow stance must be appropriately chosen for the robot to move effectively (Fig. 1, bottom). Figure 1. Robot speed depends sensitively on (top) granular compaction and leg stride frequency, as well as (bottom) gait pattern. Careful observations of leg-ground interaction and physics of intrusion forces revealed that the robot’s movement-failure transition is governed by solid-fluid transition of granular media. When a robot moves on granular media, its legs apply a downward force, which equals robot weight plus inertial force due to vertical acceleration. When the applied force exceeds the yield force of granular media, particles flow like a fluid. When the applied force is smaller than the yield force, particles re-solidify into a solid. Depending on possibilities of vertical force balance throughout a cycle, the robot can display two distinct modes of locomotion. Walking on solidified granular media: When yield force is greater than applied force at least during part of stance, granular media can re-solidify, and legs rotate on top of solid material to lift the body and propel it forward. This corresponds to effective movement (up to 1 body length per second). 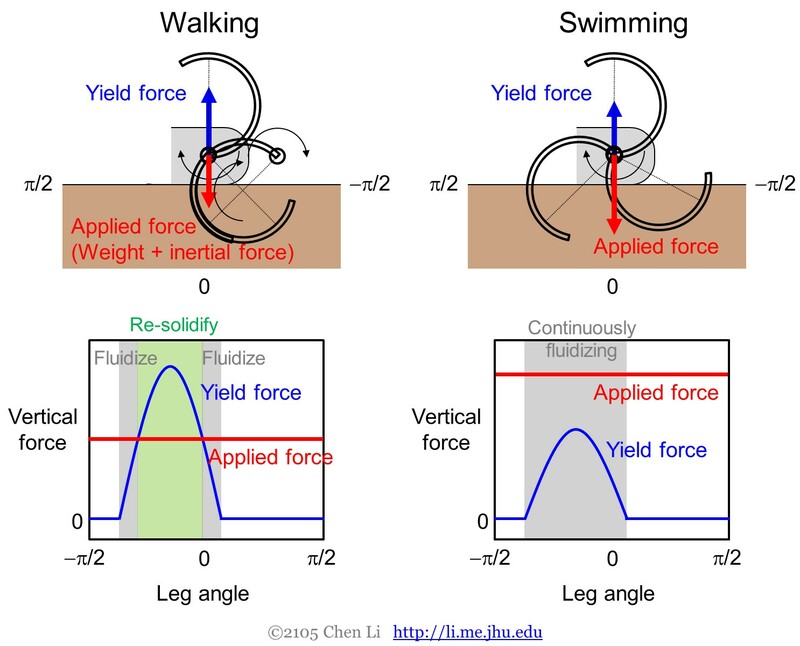 Swimming on fluidized granular media: When yield force is never greater than applied force during the entire stance, granular media cannot resolidify, and legs rotate through continuously fluidized material, unable to lift the body and propel it forward. This corresponds to failure to move (~0 body length per second). 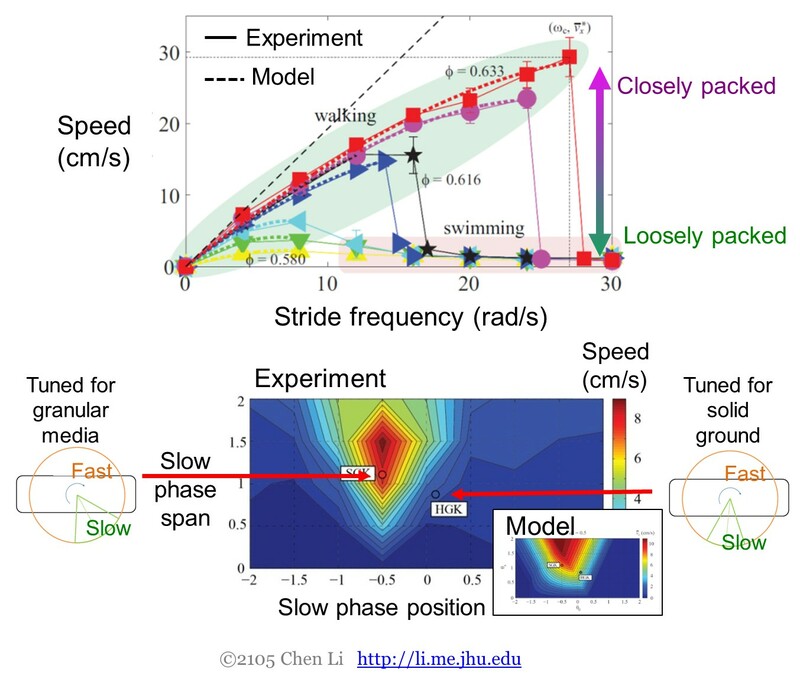 These observed movement-failure transitions (Fig. 1) can be explained by the physics of intrusion forces. For a given compaction, the force that granular media exerts on a moving intruder (i.e., yield force) increases proportionally with intruder depth. Thus as a robot leg rotate through granular media, yield force first increases and then decreases (Fig. 2). Figure 2. Walking on solidified granular media and swimming on continuously fluidized granular media. Because yield force also increases with compaction, as granular media becomes less compact, legs must penetrate deeper to generate enough yield force to balance applied force (in other words, legs slip more). As a result, the portion of stance phase over which particles solidify becomes narrower, and the legs lift the body lower and propels it by a shorter distance, slowing the robot down (Fig. 2, bottom left). Eventually, ground compaction becomes so low that legs never generate enough yield force to balance applied force, leading to constant ground fluidization and no movement forward (Fig. 2, bottom right). On the other hand, applied force (i.e., weight plus inertial force) increases with acceleration. As legs slow down, applied force decreases because centrifugal acceleration reduces. Eventually, yield force exceeds applied force again over part of stance, granular media resolidify, and movement is restored. 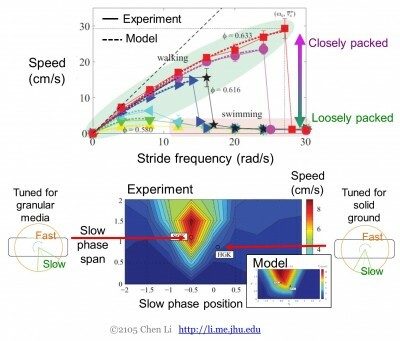 The same solid-fluid transition also explains why movement occurs only for appropriate gait pattern (Fig. 1, bottom). We discovered that intrusion forces are substantial during leg push-down are but diminish during lift-off. As a result, legs must slow down during push-down to reduce acceleration and minimize applied force.